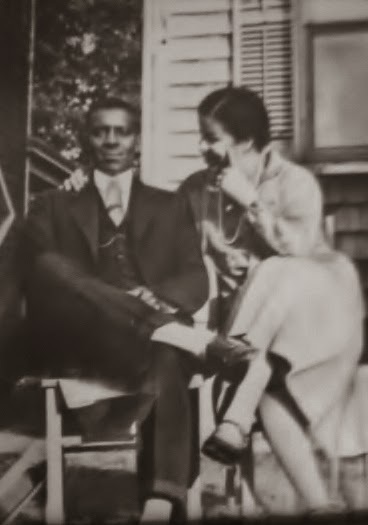 52 Ancestors: #14 -- Carrie Ethel Whitney Harrison --She Was So Tired. My great grandparents John Harrison and Carrie Whitney Harrison. I felt like it was time to tackle a different branch of the family tree. Also, it felt fitting to look at one of the strong mothers in my family tree, since it is Mother's Day weekend. Carrie Ethel Whitney Harrison pictured on the right was my maternal great grandmother. She was born on October 11, 1897 in the city of New Bern, NC. Her parents were a Samuel D. Whitney who originated from Hyde County, NC and Sarah J. Harris of Jones County, NC. She was the youngest of her siblings. Here's 1900 Federal Census showing her family. Source Information: Ancestry.com. 1900 United States Federal Census [database on-line]. Provo, UT, USA: Ancestry.com Operations Inc, 2004. The family resided at 10 Brown's Alley in an area of the city called Dryborough. Being the youngest of five siblings, I bet Carrie was doted on by everyone. She had only one sister, Amey, who sadly passed away in 1913. After that occurred, Carrie became her mother Sarah's only remaining daughter. Sarah probably watched over her ever more closely because of this. "North Carolina, County Marriages, 1762-1979 ," index and images, FamilySearch (https://familysearch.org/pal:/MM9.1.1/VXT3-P7K : accessed 11 May 2014), John Harrison and Carrie E Whitney, 14 Oct 1915; citing Craven, North Carolina, United States; FHL microfilm 000288303. Carrie married my great grandfather John Thomas Harrison on October 14, 1915 in New Bern. They were married by the Rev Clinton D. Hazel who it appears to have been the pastor of St Peter's AME Church around this time. I bet this must have been quite the event since John Harrison's father, Rev T. D. Harrison, was a well respected Methodist minister of the community. I found this Newspaper article from The NewBern Sun dated August 3, 1914 quite interesting. It mentions how they were rushing to finish work on St Peter's Church to have it done in time to commemorate it's 50 years of existence in the community. The church must have looked splendid on that October day my great grandparents were married. The couple resided in the home that Carrie would inherit from her mother Sarah Whitney. 10 Browns Alley went on to become 709 Browns Ave and then in recent years it became 709 Hatties Lane. The house was torn down years ago but here's a view of where it once stood. 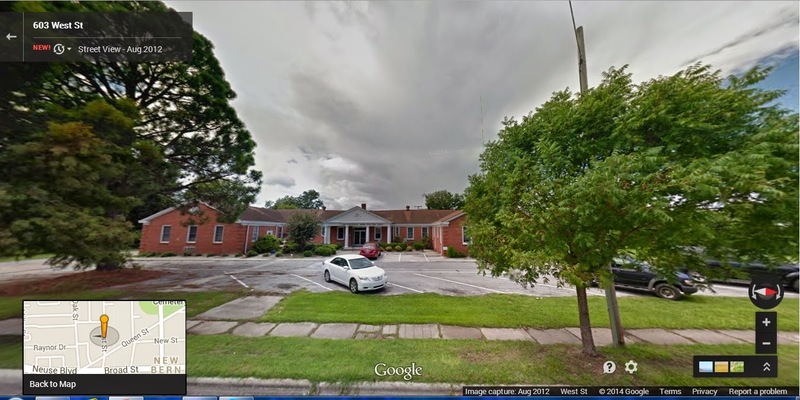 Image courtesy of Google Maps, picture captured August 2012. Vacant lot is where the house once stood. My great grandmother's brother, Samuel David Whitney, resided in the house next door on the right. John and Carrie Harrison would go on to have 13 children together. I've only given birth to two so the thought of birthing 13 children is almost inconceivable to me. How incredibly strong our ancestors were to do that and then take care of a home without all the modern conveniences we have now. Carrie was a tall and solid woman. She was someone with some meat on her bones, but not fat. Her fair complexion she had inherited from her father who according to oral history was of African and Portuguese decent. She brought life and love to her home which was dearly missed after her passing at the young age of 41. That last sentence really hit me. I am 41. 13 babies and then gone at 41. She didn't get to see her grand-babies and the beautiful legacy she left behind. I wonder what she would think about having descendants living in places as far away as Hawaii or Ireland. Carrie Harrison gave birth to her last child on July 28, 1939 via Cesarean Section at Good Shepherd Hospital. I found online at East Carolina University Digital Collections website, a picture and a brief description of what the hospital was like in 1940. The words in the description that really jumped out in my head were "Only hospital for Colored patients in an 80 mile radius." (Sigh.) There are so many things that we take for granted these days. The hospital still stands at 603 West St New Bern but it is now a nursing home. View of a building behind and just to the left of the first one. I don't know if this perhaps was the original structure and then the other building built later. Carrie had complications from this birth and died on August 1, 1939. My mother a few years back spoke of what her father recalled about the time his mother passed away. My grandfather, Lemuel Harrison, was living in New York at the time and he spoke with his mother via telephone while she was in the hospital. She kept saying she was just so tired. Sadly, he didn't make it back home to New Bern before she died. Carrie Ethel Whitney Harrison was laid to rest at Greenwood Cemetery in New Bern. To Carrie and all our ancestral mothers, Thank you. To all our mothers who are still with us, Thank you. A wonderful tribute to your grand!! Happy Mothers Day !!!!! Happy Mother's Day to you too! Thank you so much. I know this is late. Thank you so much. A very touching tribute and story. Thanks Lorine and thanks for stopping by! WoW reminds me of Grandma Eddie. She had 10 children and mostly did it on her own. After her husband left. Such strength. They do all they can for us. Great post. Loved the Google pics. I need to learn to do this. Your right True. Such strength. I have been reading your posts for some time. I wish I'd commented sooner. Very detailed, interesting and informative. A labor of love, I'm sure. Thank you.